NOTE: Although The Twinery team is posting their projects today......Please be sure to visit the Clearsnap blog tomorrow, Saturday, May 5, to see what their designers created with our products. Fun, huh? Clearsnap Cat's Eyes were my very first ink pads when I started scrapbooking back in 2006, and they are still some of my favorites. I got a chance to play with a few new-to-me tools while creating this card, and I had a blast! I started with a Colorbox Cat's Eye Queue and a Stylus with circle white foam tips. Immediately I saw polka dots! I smooshed the tips into the ink pad and "stamped" the circle image onto my white card panel, alternating colors between the orange and blue. Super easy and fun! To finish off the sentiment panel, I tied three little bows of twine, one Cantaloupe and two Shore, which were perfect matches to the inks I chose. Now, you know this wouldn't be a proper party without a prize, right? 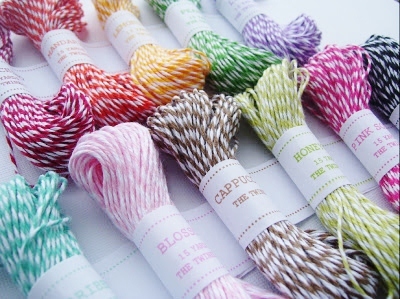 How about some fabulous twine? The Colorful Bunch Sampler Pack is a $20 value, and oh, so purdy! You can check out The Twinery Blog for details on how to win! Thanks so much for stopping by, and have a fabulous weekend! Love polka dots, so naturally I love this card! Greaf colors too. love what you did with the applicators. I did one like this but mine didnt look so good---LOVE this! Awesome colors! "You're all I've ever wanted, and my arms are open wide..." I'm going to be singing that song all day! LOVE how you created the polka dots! Adorable card, Shannan! 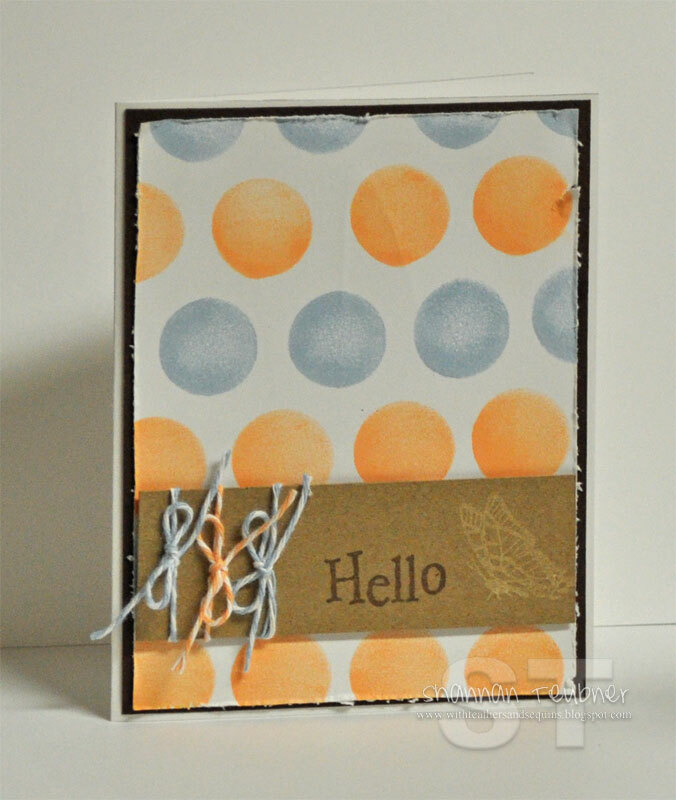 Adore the idea of using the stampers for your background! Love the light yellow on the kraft, a deeper watermark. Great card! Love the inked circles and they look great with the little bows. So cute, the colors really POP!! Love the polka dots and the simple look of the card. Super love your project!! LOVE the colour combos! Great way to create polka dots! Very fun card--love the polka dots and the twine coordinates so well. What a great idea - polka dots!! The card is really cute and I can't wait to try the dots that way. Great tips. thanks. Sweet and colorful project. Reminds me of a "gumball" yo-yo I once had as a child. Very cute! Love the colors of this card. Cute! Love seeing everything y'all are doing with twine. The Twinery rocks! I love how you used the twine! Great idea! Simple but effective, I love it. Very cute, love the color combination and the big dots!! The paper goes great with the twine. LOVE LOVE LOVE the color combo in this! Very cute! Thanks so much for sharing! Love the look of this card! Such a pretty card, and just the right amount of twine to highlight it! Love the card - great colour combination and cute use of twine! Love the kraft paper :) makes the colors of the ink and the twine stand out perfectly! Those polka dots are so fun and colorful. Cute card. clean and simple is my style, so i'm really liking this card. tfs. Fun card! Love the dots. Cute card Shannan. That twine matches perfectly with those butterflies. So beautiful.